Sure there are the occasional functional Christmas tree ornaments; we had one that plugged into the lights and was supposed to sound like a bird gently trilling its song, but was in fact so eardrum-piercing that we were forbidden from using it. But in general, ornaments are just supposed to be for looks, right? Not so fast — this 3D-printed ornament has a 3D-printer inside that prints other ornaments. One day it might just be the must-have in functional Christmas decor. Given that [Sean Hodgins] had only a few days to work on this tree-dwelling 3D-printer, the questionable print quality and tiny print volume can be overlooked. But the fact that he got this working at all is quite a feat. We were initially surprised that he chose to build a stereolithography (SLA) printer rather than the more common fused deposition modeling (FDM) printer, but it makes sense. SLA only requires movement in the Z-axis, provided in this case by the guts of an old DVD drive. The build platform moves in and out of a tiny resin tank, the base of which has a small LCD screen whose backlight has been replaced by a bunch of UV LEDs. A Feather M0 controls the build stage height and displays pre-sliced bitmaps on the LCD, curing the resin in the tank a slice at a time. Results were mixed, with the tiny snowflake being the best of the bunch. For a rush job, though, and one that competed with collaborating on a package-theft deterring glitter-bomb, it’s pretty impressive. Here’s hoping that this turns into a full-sized SLA build like [Sean] promises. Rather than extruding molten plastic, these printers use light to cure resin layer-by-layer. In theory if the printer is good enough to cure the light-activated resin for a high resolution print, it should be able to do much the same thing with photosensitive PCBs. 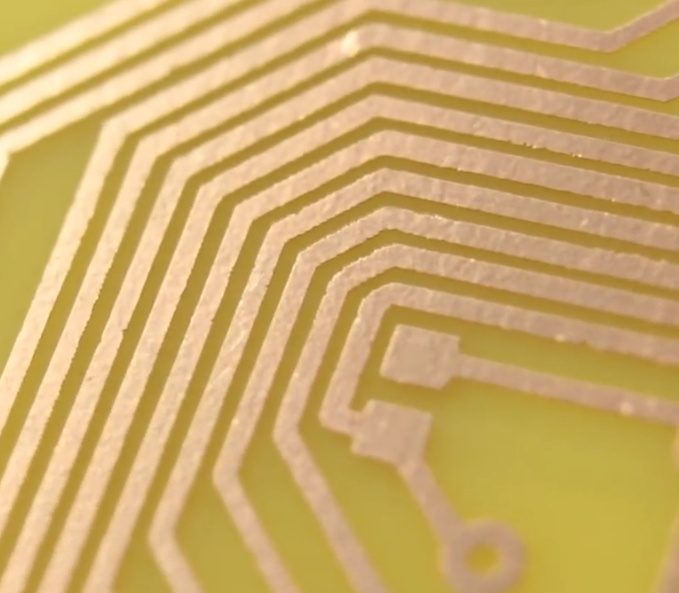 Unfortunately, getting an STL out of a PCB design program takes a few intermediary steps. In the video after the break, [Electronoobs] shows his workflow that takes his design from EasyADA and turning it into a three dimensional object the DLP printer will understand. He does this with Blender and it looks pretty straightforward, but in the past we’ve seen people do similar tricks with Inkscape if that’s more your style. Once you’ve grafted another dimension onto your PCB design, you may need to scale it to the appropriate size. [Electronoobs] notes that his STL for a 60 mm wide PCB came out of Blender as less than 2 mm wide, so you might need to break out the dreaded mathematics to find the appropriate scale value. Once the dimensions look good, you can load this file up into the printer as you would any normal print. On the printer side of things, [Electronoobs] manually laminates UV photoresist film onto some copper clad boards with an iron, but you could skip this step and buy pre-sensitized boards as well. In any event, you drop the board where the UV resin normally goes, press the print button, and wait about ten minutes. That should give it enough time to expose the board, and you then proceed with the normal washing and acid bath process that hackers have been doing since time immemorial. As [Electronoobs] shows, the results are quite impressive. While this still won’t make it any easier for you to do double-sided PCBs in the home lab, it looks like a very compelling method for producing even SMD boards with relative ease. This isn’t the first time somebody has tried using a DLP printer to run off some PCBs, but now that the technology has matured a bit it looks like it’s finally becoming practical. Who doesn’t want a pocket protector projector? Nothing will impress a date more than being able to whip out a PowerPoint presentation of your latest trip to the comic book convention. The key to [MickMake] build is the $100 DLP2000EVM evaluation module from Texas Instruments. This is an inexpensive light engine, and perfect for rolling your own projector. You can see the result in the video below. If you don’t need compactness, you could drive the module with any Rasberry Pi or even a regular computer. But to get that pocket form factor, a Pi Zero W fits the bill. A custom PCB from [MickMake] lets the board fit in with the DLP module in a very small form factor. Smoothing the layer lines out of filament-based 3D prints is a common desire, and there are various methods for doing it. Besides good old sanding, another method is to apply a liquid coating of some kind that fills in irregularities and creates a smooth surface. There’s even a product specifically for this purpose: XTC-3D by Smooth-on. However, I happened to have access to the syrup-thick UV resin from an SLA printer and it occurred to me to see whether I could smooth a 3D print by brushing the resin on, then curing it. I didn’t see any reason it shouldn’t work, and it might even bring its own advantages. Filament printers and resin-based printers don’t normally have anything to do with one another, but since I had access to both I decided to cross the streams a little. The UV-curable resin I tested is Clear Standard resin from a Formlabs printer. Other UV resins should work similarly from what I understand, but I haven’t tested them. The 3D printing revolution is upon us and the technologies associated with these machines is evolving every day. Stereolithography or SLA printers are becoming the go-to printer for high-resolution prints that just can’t be fabricated on a filament-based machine. ADAM DLP 3D printer project is [adambrx]’s entry into the Hackaday Prize and the first step in his quest for higher quality prints on a DIY budget. [adambrx]’s current iteration employs a Raspberry Pi 3 and a UV DLP Projector, all enclosed in a custom frame assembly. The logs show the evolution of the printer from an Acer DLP to the current UV DLP Light Engine. The results are quite impressive for a DIY project, and [adambrx] has put up images of 50-micrometer pillars and some nifty other prints which show the amount of work that has been put into the project. It is safe to say that [adambrax] has outspent the average entry to the Hackaday Prize with over €5000 spent in around 3 years. Can [adambrx] can keep this one true to its DIY roots is yet to be seen, however, it is clear that this project has potential. We would love to see a high-resolution SLA printer that does not cost and arm and a leg. Want Gesture-Tracking? All You Have To Do Is Lift Your Finger. Watching Tony Stark wave his hands to manipulate projected constructs is an ever-approaching reality — at least in terms of gesture-tracking. Lift — a prototype built by a team from UC Irvine and FX Palo Alto Laboratory — is able to track up to ten fingers with 1.7 mm accuracy! Lift’s gesture-tracking is achieved by using a DLP projector, two Arduino MKR1000s, and a light sensor for each digit. Lift’s design allows it to work on virtually any flat surface; the projected image acts as a grid and work area for the user. As their fingers move across the projected surface, the light sensors feed the information from the image to the Arduinos, which infers the location of each finger and translate it into a digital workspace. Sensors may also be mounted on other objects to add functionality. So far, the team has used Lift as an input device for drawing, as well as using it to feign gesture controls on a standard laptop screen. The next step would be two or more projectors which would allow Lift to function fully and efficiently in three dimensions and directly interacting with projected media content. Can it also operate wirelessly? Yes. Yes, it can. While we don’t have Tony Stark’s hologram workstation quite yet, we can still play Tetris, fly drones, and mess around with surgical robots. A DLP 3D printer works by shining light into a vat of photosensitive polymer using a Digital Light Processing projector, curing a thin layer of the goo until a solid part has been built up. Generally, the resolution of the print is determined by the resolution of the projector, and by the composition of the polymer itself. But, a technique posted by Autodesk for their Ember DLP 3D Printer could allow you to essentially anti-alias your print, further increasing the effective resolution.